Some RNA viruses are being discovered by scientists as having the ability to protect themselves by exploiting a natural "brake" on the immune system, research has shown. They say their function is complex, not from nature and involves genetic material that could only have been designed in laboratories to manipulate gene activity and exploit inflammatory processes. Viruses which can cause diseases including cancer, exploit the tiny molecules present in everyone's DNA, called microRNAs, to turn cells into a viral 'hotel' which they can check into, to cause infection and spread says research in journal Nature Cell Biology. Scientists estimate a third of genes may be regulated by microRNAs. The study shows how viruses are able to "upregulate" the production of immune system microRNAs to facilitate infection. "This is not new research," says Infectious Disease Specialist Dr. Morgan Blankenship. "Although many RNA viruses have evolved with humans, we've seen a steady rise in a variety biological anomalies that did not exist even 30 years ago." Dr. Blankenship says that some viruses could not possibly have evolved in nature the way they are presented. "The swine flu is a good example of a designer virus that we may have developed to study infection rates," he stated. Many experts have declared that the H1N1 virus (in its 2009 configuration as isolated by the CDC) could only have been cultured in a lab. "In this case it's a genetic mixture from avian, swine and human flu viruses that were three separate strains spanning three continents which we know could not have developed naturally." Flu viruses contain 8 strands of RNA, which code for 10 proteins. 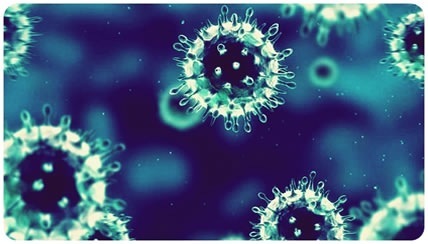 If two flu viruses infect a cell at the same time, new viruses budding from that cell can contain a mixture of RNA strands from the two original viruses - a phenomenon called reassortment. However, Dr. Blankenship says that the way RNA viruses are recombining are not repeated reassortments but cut and paste configurations that only genetic engineers and viral specialists have the ability to design. Mutation is the major cause of changes in the genetic code of the viruses. Scientists have claimed that RNA mutation is higher because RNA enzymes are more likely to commit errors, however the mutation rates, their frequency and configurations are now unprecedented. In DNA viruses, viral genetic code is injected in the host DNA for duplication and decoding. RNA viruses skip DNA for duplication and decoding. Scientists have used the unique ability of RNA viruses to create stronger versions that break down the human immune system. The swine flu H1N1 virus had three parents from two continents and appeared suddenly without warning, evading all routine flu surveillance and quarantine; sequence data suggest it may have been created from a faulty vaccine given to pigs in North America. The CDC isolated and genetically altered (engineered) the H1N1 flu virus so that it could be used to make hundreds of millions of doses of the agent. The new genetically engineered (novel) A-H1N1 virus then contained a lethal combination of bacteria, viruses, and toxins. Citing concern over Ebola’s possible use as a weapon, the U.S. National Institutes of Health has awarded almost $3 million to a laboratory in Colorado to engineer a fast diagnostic test for the virus. What is interesting about the current Ebola strain is that it has never been isolated by the CDC or WHO scientists. The ability to diagnose infections almost instantaneously would go a long way to halt what could be an artificially induced spreading of the disease in its weaponized form, but you can bet the propaganda matrix will do their best to spin a new story on infection rates. Ebola research has garnered an unprecedented amount of international attention and funding in recent months and I will soon outline exactly why fears of this virus are exagerrated and expand on a previous article as to why it is based on ulterior motives. There is a direct and statistical correlation between the diseases that affect a given population (in developed nations) and the frequency of vaccines administered. Because vaccines do not provide the protection claimed by scientists and cannot realistically induce herd immunity, they make matters worse. When there is widespread vaccination, viruses can spread without any visible disease. Vaccines create strong selective pressure driving the evolution of new strains that can dodge the immune attack provoked by the vaccine. Three vaccines used to prevent respiratory disease in chickens have swapped genes, producing two lethal new strains that previously killed tens of thousands of fowl across two states in Australia. The creation of the deadly new variant was only possible because the vaccines contained live viruses, even though they were weakened forms, said Joanne Devlin, lead author of a paper published in the journal Science. When the live-virus version of the polio vaccine, called Oral Polio Vaccine (OPV) evolves, it can act like wild poliovirus and continue the threat of contagion. Over time, the vaccine can mutate, and even a 1 percent genomic change in the virus permits the virus to behave like a wild poliovirus. As a result, they are finding evidence of vaccine-derived polio cases in humans. SV40 is an abbreviation for Simian vacuolating virus 40 or Simian virus 40, a polyomavirus that is found in both monkeys and humans. ? The SV40 virus was believed to suppress the transcriptional properties of the tumor-suppressing genes in humans through the SV40 Large T-antigen and SV40 Small T-antigen . Mutated genes may contribute to uncontrolled cellular proliferation, leading to cancer. Michele Carbone, Assistant Professor of Pathology at Loyola University in Chicago, isolated fragments of the SV-40 virus in human bone cancers and in a lethal form of lung cancer called mesothelioma. He found SV-40 in 33% of the osteosarcoma bone cancers studied, in 40% of other bone cancers, and in 60% of the mesotheliomas lung cancers. Dr. Michele Carbone openly acknowledged HIV/AIDS was spread by the hepatitis B vaccine produced by Merck & Co. during the early 1970s. It was the first time since the initial transmissions took place in 1972-74, that a leading expert in the field of vaccine manufacturing and testing has openly admitted the Merck & Co. liability for AIDS. The CDC admitted t hat more than 98 million Americans received one or more doses of polio vaccine within an 8-year span from 1955-1963 when a proportion of the vaccine was contaminated with a cancer causing polyomavirus called SV40. Curcumin, found in turmeric, stopped the potentially deadly RNA Rift Valley Fever virus from multiplying in infected cells, says Aarthi Narayanan, lead investigator on a new study and a research assistant professor in Mason’s National Center for Biodefense and Infectious Diseases. Ultimately, curcumin could be part of therapies that help defeat RNA viruses in the future. Research has reported that RNA viruses encode selenium-dependent glutathione peroxide genes. Selenium may act like a 'birth control pill for the virus and prevent the infection from every transmitting from one human being to another. A daily intake of 2000 mg. of Vitamin C or more may be adequate for preventive purposes, but larger quantities such as 10,000 mg are required in halting or reversing cancer, heart disease and the transmission of RNA viruses. High-potency Vitamin C produces dramatic healing in many chronic hepatitis C patients. In 1949, Dr. Klenner reported successful treatment of polio, diphtheria, herpes zoster, herpes simplex, chicken pox, influenza, measles, mumps, and viral pneumonia with injections of large doses of vitamin C.
Vitamin C has a broad spectrum antioxidant function with the ability to protect cell structures and DNA from free radical damage. Vitamin C is remarkably safe even in enormously high doses. Compared to commonly used prescription drugs, side effects are virtually nonexistent. No matter how high the concentration, vitamin C does not harm healthy cells. Yet, through an array of enzymatic and metabolic reactions, vitamin C has an impressive ability to protect and treat almost any virus. While oral doses can correct deficiencies and maintain antioxidant levels within the body, IV infusions are required to reach pro-oxidant, anti-viral and anti-cancer plasma levels. To harness maximum benefit, both oral and IV treatments are needed to take advantage of the wide range of beneficial effects. Dave Mihalovic is a Naturopathic Doctor who specializes in vaccine research, cancer prevention and a natural approach to treatment. Listed below are links to blogs that reference this entry: RNA Viruses Are Being Exposed As Man-made And Vaccines Are The Carriers Spreading Disease Without Any Visible Signs. This page contains a single entry by Toni published on November 6, 2014 5:39 PM. Mom: Daughter paralyzed because of flu shot was the previous entry in this blog. Depopulation vaccine in Kenya and beyond is the next entry in this blog.